Personally, I am holding out until the contents of Kevin Trudeau’s biometric safe in his Swiss mansion get put on the auction block. A going-going-gone thanks to reader Annmarie for letting us know about the Kevin Trudeau fire sale. Put Away Your Tin Foil Hats! The E-Pendant with EMR Blocker is Here! It’s not surprising you had to use a still photo; if it were a video, we wouldn’t be able to hear Trudeau’s voice over how loud that shirt is. Just lookng at it, you know there has to be a suede jacket with flared collar that goes with it. I’m sorry, I can’t get past the shirt. You just can’t wear that thing in this day and age and expect me to take anything you say seriously. 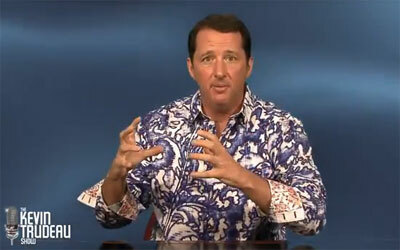 Can those Kevin Trudeau items be bought with Bitcoins? Now if only Santo Gold would get convicted then we might have some hope that Blood Circus’d be put on the auction block in a fire sale and eventually released. I really want that biometric safe of his. Just the place to store my passport securely. That shirt: Note the contrasting/clashing design on the folded-back cuffs. It’s as loud on the inside as it is on the outside! I don’t think there’s anything from Trudeau that I’d want to buy at auction. Infused with his energy? More like infused with crook-cooties. But I do hope there is someone who’s in the market for “amulets” so his victims will be able to get some kind of compensation. Why would anyone want an amulet/tailsman infused with the energy of a person who wasn’t slick enough in his con to not get caught? I’m no expert on energy and whatnot but wouldn’t I want something infused with the energy of a lucky person? And that shirt…wow. I have to believe Trudeau had this specially made (by his secret society tailor perhaps?) because I refuse to believe we live in a world where shirts like this are mass produced. Is his personal genie up for sale? I wouldn’t mind having my own genie. Well FINALLY…duh.the criminal is labeled again as such. to pick up your soap.